I haven't been to May street since last Thursday. I assume everything is gone now. I'll check it later this week or next weekend. The whole is rather unfortunate and sad, certainly the complete lack of coverage in the local media. Je ne suis pas alle à la rue mai depuis jeudi dernier. Je suppose que tout est parti maintenant. Je vais vérifier plus tard cette semaine ou la fin de semaine prochaine. Cette histoire est plutôt malheureuse et triste, certainement l'absence totale dans les médias locaux. Thanks for the updates. Because it's hard to get too upset with how this whole thing went down (how do you argue against *a bridge*? 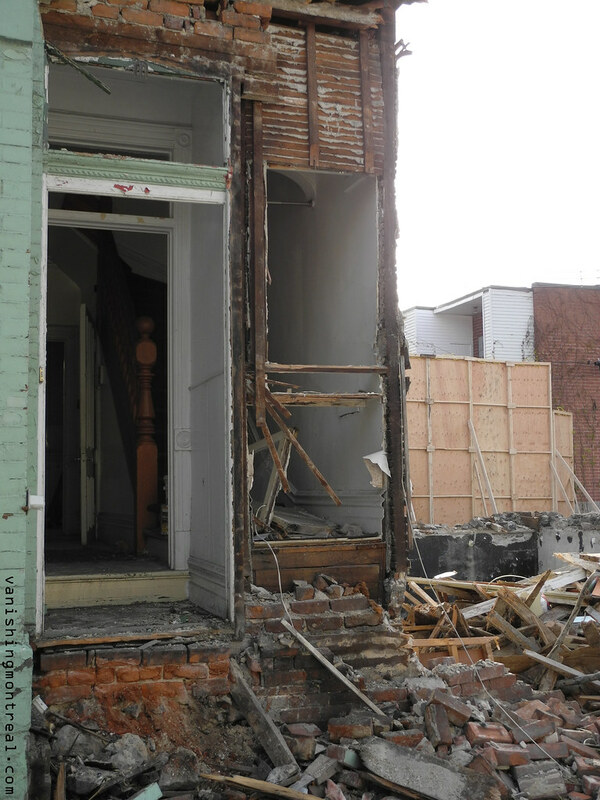 ), it's been more interesting for me to see how this planned demolition works out. I was hoping the local media would do something on how much heritage and materiel could be salvaged and recycled for these classic houses. I don't get the feeling that Montreal developers appreciate Montreal's unique architecture or history at all, with the result that we get ugly and bland condos that no major city would want to emulate.